So I've finally gotten some flights on on the winter builds and moved on to some more building. I thought this one might interest folks here. 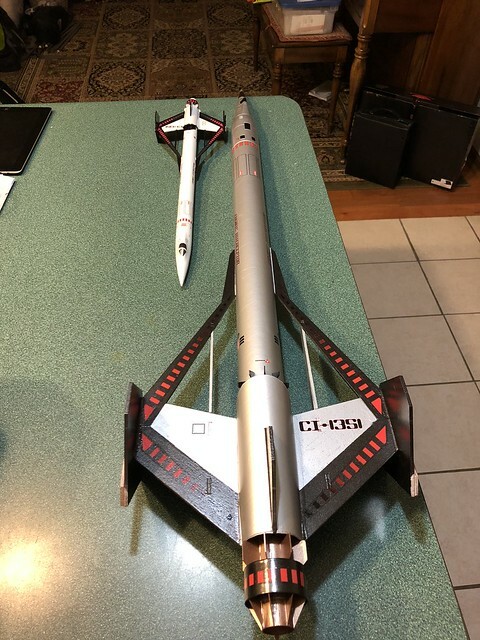 My younger son made off with my Cosmic Interceptor kit when I pulled it out of the stash. So I decided to do a downscale for myself. 13mm motor mount. PNC-50B (I think) to approximate the Interceptor nose cone. Folded cardstock for the intakes and radiator vanes. Well done! How did you scale down the decals? 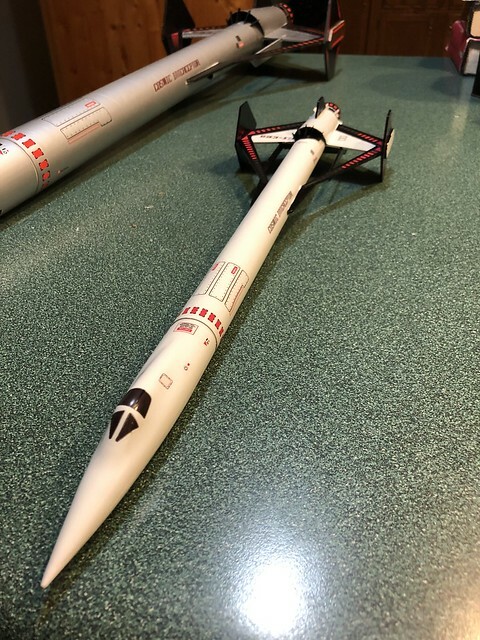 Yeah I was thinking of doing that as well, but starting with the old bt55 cone that is a downscale nosecone already including most of the markings. 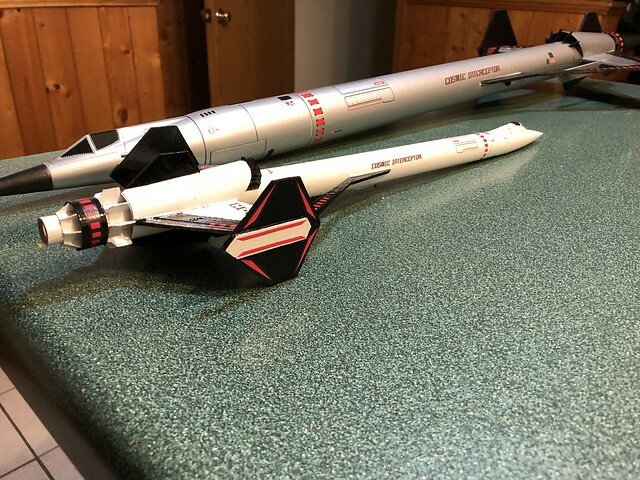 These days, when I open a kit to build it, the first step is to throw all the balsa boards, templates and decals on the scanner. When i want to do an upscale or a downscale, I bring the scan into Adobe Illustrator and run an image trace - converting it into vector art. I clean up the art a bit, and then I can scale to my heart's desire. 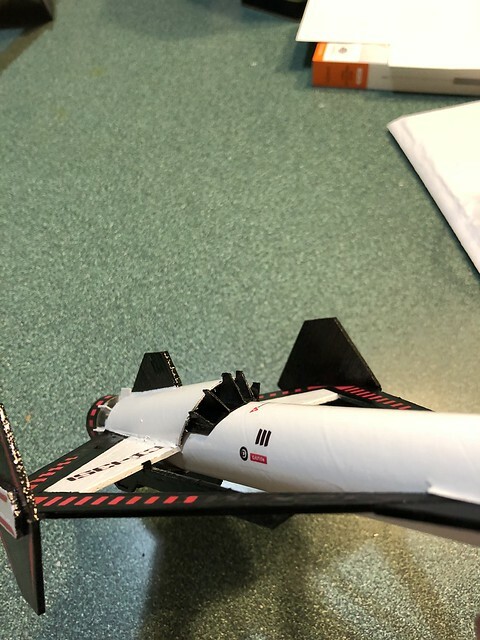 The converted balsa scans I send with my son to the high school, which has a laser cutter. The decals I print at home on an HP Color laserjet. In this case, I did a little tweaking. one of the little panel decals is an oblique parallelogram. The originals are identical. I mirrored one so they go on either side of the nosecone and angle properly. I haven't [yet] treated myself to a white toner cartridge, so I can't do a white base layer. But decals over straight black are still easy to manage. I make a version of the file with a black background and then print it on white decal paper instead of clear. Scott - the BT55 downscale would be more accurate, for sure. But I have a fetish for 13mm motors. And a box of Centuri B4s. And am signed up with the expired motor program. Hey I never heard of that, what is the expired motor program ? It's easy and fun. I sign up with Steve for all the WOOSH launches once the sked is announced. When flying them, I note it in the comments on the flight card. After each launch day, I send a note to update Steve with the motors flown, lot numbers and results. I happen to mentally time all the delays, so along with 'good flight', I comment on if the delays seemed about right.